The city, founded in 1881 and incorporated in 1902, was an important port of entry on the US-Mexican border until the Gadsden Purchase of 1853. A nickname was given to the city at the time of its founding, "New Chicago". It was expected that with the surge of railroad usage, that the city would grow drastically and resemble Chicago, Illinois. 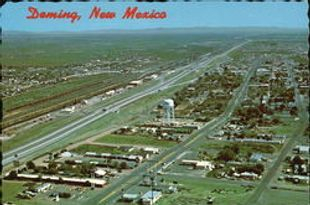 Originally Deming was called Mimbres Junction and is now named after Mary Ann Deming Crocker, wife of Charles Crocker, one of The Big Four of the railroad industry. 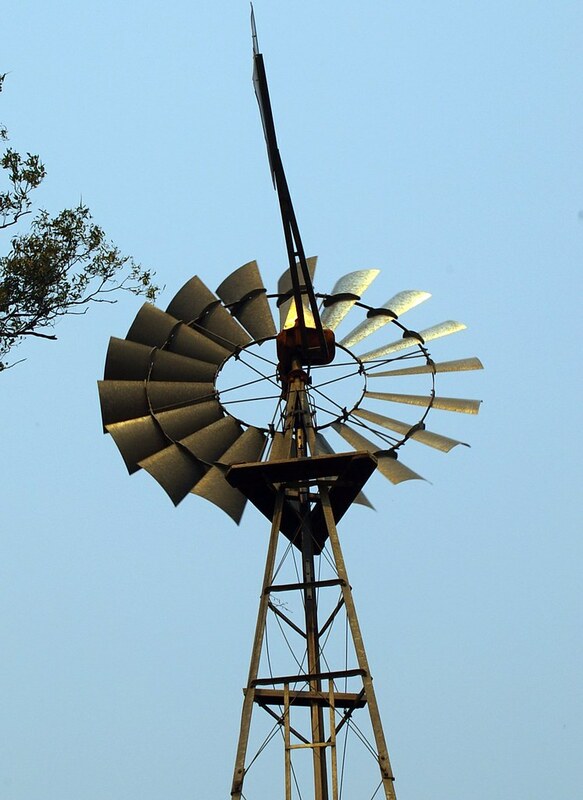 The town was known too as the “City of Windmills” for the machines which were used to pump water from aquifers. This water was and is still used to raise chili peppers, onions, cotton, pecans, feed crops and cattle. During World War II, a U.S. Army Airfield was constructed here. Today, it hosts the world’s largest chili processing plant and the town’s economy has always been largely based on cattle and farming. There are numerous ancient Native American sites around Deming. The Mimbres and Casas Grandes cultures made pottery of remarkable quality, and the Deming area is rich in native pottery artifacts, as well as beads, stone implements, stone carvings, graves, etc. 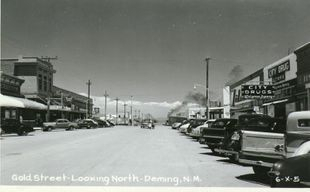 37 buildings in Deming have historical significance, 16 have been placed on the State Historic Register and 4 are also on the National Register of Historic places. Deming is the birthplace of the songwriter Nacio Herb Brown. Among Deming's current residents is the musician and songwriter Max Crook, who co-wrote Del Shannon's hit song "Runaway". 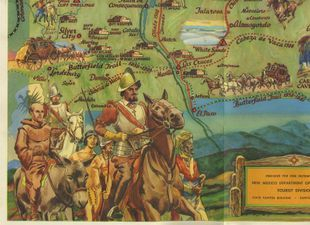 Prior to the arrival of the railroads, Deming was located close to the Butterfield Overland Stagecoach route which ran to the north of the present town. Harvey House - When the first transcontinental railroad was completed at Promontory Summit, Utah in 1869, the last tie was secured with a golden spike to commemorate the momentous occasion. Deming is famous as the locale of the silver spike, for in March 1881, the town became the site of the completion of the second transcontinental railroad, uniting the Atchison, Topeka, and Santa Fe (ATSF) from the east with the Southern Pacific from the west. 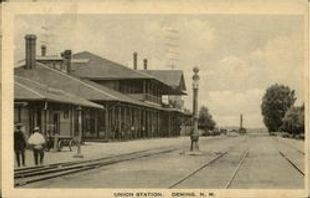 Upon the joining of the two lines, Deming received a ?union station? building serving both railroads. It was a large two story structure that served as the depot, a hotel and Harvey House restaurant. English immigrant Fred Harvey teamed up with the ATSF to create a chain of fine dining establishments along ATSF lines, The Harvey House was demolished in the 1960s. Deming’s depot welcomed Presidents Hayes, Harrison, McKinley, Roosevelt and Truman. In 1930, the station was remodeled into a one story building with wood clapboard and tall, full length windows. It had a hipped roof and deep eaves to protect passengers from the hot desert sun. In 2004, it was relocated to Pit Park where it can be admired by visitors. The area today occupied by Deming was home to the Mimbres Indians about 1000 years ago. Living in small agricultural villages along the river which bears their name, they produced pottery which is today world famous. Mysteriously, they all but disappeared by the thirteenth century. Featuring abstract images of animals, pieces discovered in the early twentieth century provided design motifs for the ATSF. Mary Colter, chief architect and interior designer for the Harvey House system, used these designs in a set of china used on all ATSF Super Chief dining cars from 1936-1970. Reproduction Mimbreno china is still sought today by railroad enthusiasts as well as admirers of Native American crafts. 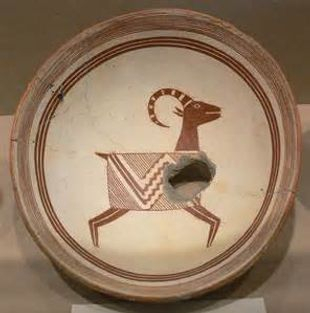 Visitors to Deming can visit the Deming Luna Mimbres Museum to admire original Mimbres pottery discovered at archaeological sites. 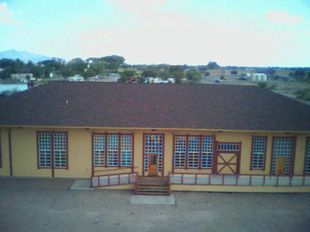 The Deming Luna Mimbres museum, housed in the historic Deming Armory (1916) and Customs House, features a collection of Mimbres Indian painted pottery, historic period-furnished rooms in the Seaman Fields House, an antique auto collection, a restored Harvey House restaurant, a doll collection, as well as a geological section and many more displays. ATTRACTIONS: Nearby are City of Rocks State Park, with interesting volcanic rock formations, and Rockhound State Park, offering mineral & rock collecting opportunities. The Great American Duck Race is held every year on the third weekend of August. 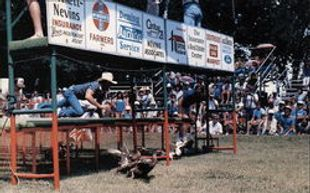 It features wet and dry duck race tracks, hot air balloon show, a Tournament of Ducks Parade, with a carnival and a variety of vendors setting up their wares in the Courthouse Square and surrounding property. In 1901 Luna County was created from portions of Grant and Dona Ana counties. 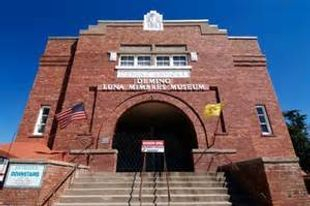 Located in southwest New Mexico, Luna County was named for Don Solomon Luna, a local rancher and politician. 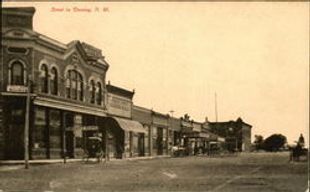 The county seat is Deming, which was founded in 1881 and officially incorporated in 1902. 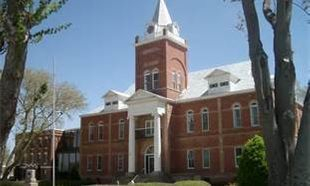 The Luna County Courthouse, designed by W.B. Corwin, was built in 1910. It is the site of the controversial trials of the Villiistas—the men involved in the famous 1916 Columbus raid during which 18 Americans were killed. Four of the Villiistas were later hanged in the yard of the Luna County Jail. The Luna County Courthouse is on the National Register of Historic Places..
Camp Cody, in Luna County, New Mexico, was established in 1917. It was named for William F. Cody, known as "Buffalo Bill", who promoted a Wild West show and who died in 1917. 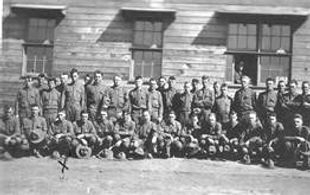 During the Great War, the camp was a huge 'tent city' for the Thirteenth provisional Division of the Federal National Guard troops, primarily from Minnesota, North and South Dakota, Iowa and Nebraska. An August, 1917 issue of the 'Iowa City Citizen' describes the camp: Camp Cody is located just north of Deming. It is estimated to be over 4,000 feet above sea level. Immediately south of Deming lays the mountains called the Three Sisters. At this point General Pershing with his forces crossed into Mexico in 1915. Hardly any vegetation is upon this camp site. After the war, the site was used as a tuberculosis sanatorium for veterans until 1922, and then as a hospital until buildings were destroyed by fire in 1939.